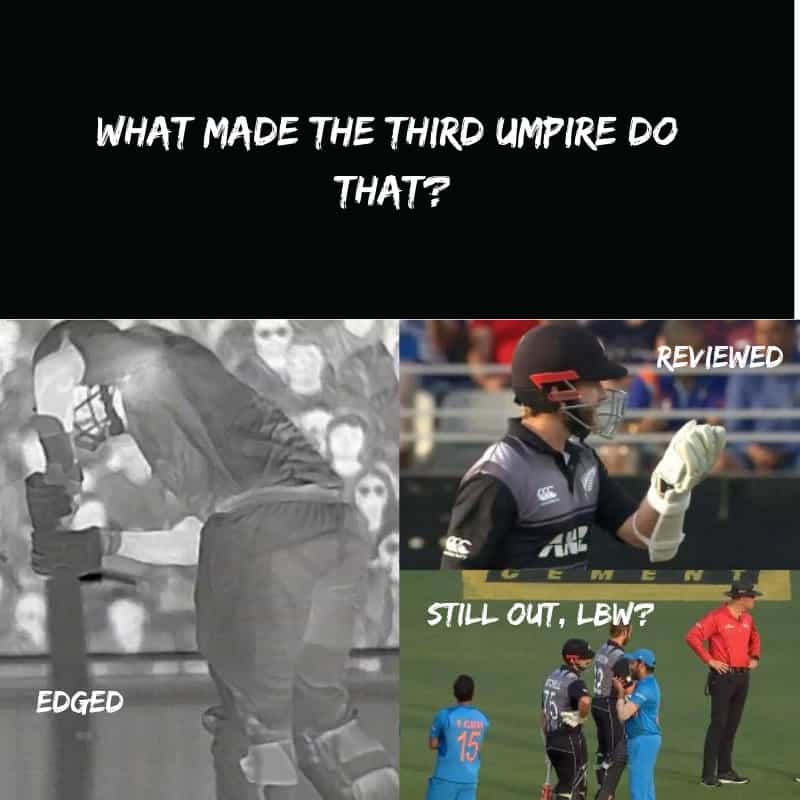 Umpire Decision Review System (or DRS as it’s commonly known) started a furor on Friday during the 2nd T20I of the ongoing T20 cricket series between India and New Zealand. During the first innings of the match, Daryl Mitchell of New Zealand was adjudged “Out” by the on-field cricket umpire. Having a review at his disposal, and a belief that he has edged the ball, he reviewed the decision. And it did seem that he edged the ball (if you go with the deviation and Hot-spot technology). But to his (and the whole crowd’s) dismay, and utter disbelief, the third umpire didn’t overturn the on-field decision. Being called to review the decision, Shaun Haiq (the third umpire) followed the set procedure for an LBW review. Front foot? It was a legal delivery. Did he get an edge? In slow-motion replay, it seemed he did. In Hot-spot, there was a mark on the bat as the ball passed it. In Snicko, there was a flat-line as the ball passed the edge. NO SOUND. And he went with NO EDGE. 3. Ball tracking? 3 Reds! OUT! These were some of the comments that flooded social media. The commentators were furious, you should have heard Simon Doull. So why the third umpire did so? According to the protocol set for the third umpire for a player/umpire review, the third umpire exchanges factual details with the on-field umpire about the delivery in question. If in any case, he feels that the technological evidence is “Inconclusive” (be it in case of edges or catches) to overturn the on-field decision, he communicates the same to the on-field umpire and the decision stands. In this particular case, we believe, that’s what caused the problem. He didn’t acknowledge the conflict between the Snicko and the Hot-spot properly, during his communication. But even if he did, the decision would have been OUT. Nope! There have been a lot of controversies on DRS which rather made it a dubious review system. Apparently, technology also has its limitations. But we hope for a better DRS in the future which could prevent such controversial decisions from happening. We are leaving you with a compilation of some of the most controversial ones. Enjoy and leave your thoughts about what you think about DRS. Or, how it could be improved?